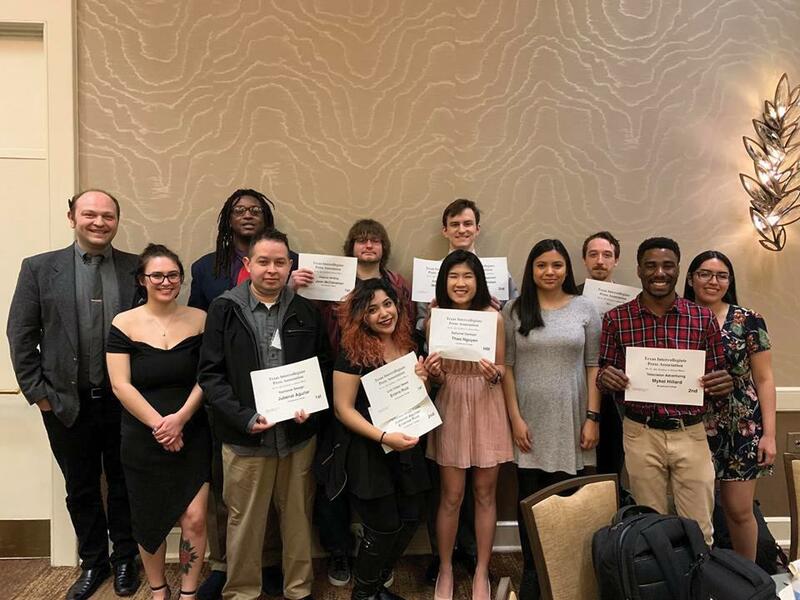 The Brookhaven Courier editors and staff brought home 34 awards from the annual Texas Intercollegiate Press Association convention. Staff spent three days of their spring break in Corpus Christi, Texas, participating in on-site contests, workshops, critiques and roundtables March 13-16. Twelve Brookhaven College journalism students competed in 28 of 30 on-site competitions designed to test their skills in varying specialties across multiple journalistis disciplines. “I am especially proud of the live awards won by our students,” Daniel Rodrigue, student publications adviser, said. Brookhaven’s contestants placed in top spots in 12 of the contests against students from two- and four-year schools including The University of Texas at Arlington, Baylor University, Texas A&M University – Commerce, Midwestern State University, Richland College and Kilgore College. First place winners included Jubenal Aguilar, editor-in-chief, for Yearbook Design; John C. McClanahan, editor at large, for Feature Writing; Eriana Ruiz, multimedia director and photo editor, for Live Video News; and Jacob Vaughn, managing editor and music editor, for Copy Editing. Contestants followed rules for each contest, including completing work within specific time constraints. “When you’re in a timed setting like that it creates a focus on your writing that’s hard to get anywhere else,” Matthew Brown, opinions editor and copy editor, said. Brown earned two awards – second place in Public Relations Crisis Management and third in Editorial Writing. Brown said his first year at TIPA was a blast. “I hadn’t really done any of the things I competed in before, but I just studied, I did my best and I did well,” he said. Staff also won 18 awards for previously published content in newspaper, literary magazine, photography and multimedia projects. The Courier also swept the Individual Overall Excellence categories in Division II, which included two-year schools such as Eastfield College, Amarillo College, Tyler Junior College and Del Mar College. Only one nominee per school is allowed in each category. Aguilar was awarded Editor and Photographer of the Year, Vaughn won Reporter of the Year and Jacqueline Arredondo, former managing editor and art director, won Designer of the Year. At the TIPA awards breakfast March 16, Aguilar also won the Michael Warms Scholarship for 2-Year Students worth $400. Only four community college students received the scholarship. During the convention, students attended workshops to improve up and coming journalists within their crafts. Many experienced journalists, including Joe Pappalardo, former editor of the Dallas Observer, attended TIPA to pass on their knowledge to the next generation of journalists. This entry was posted in Awards, Campus News by The Courier. Bookmark the permalink.